Jimmy Osmond, dubbed as the nicest man in pop music, has assured fans that they will have a more intimate and interactive experience during The Osmonds’ forthcoming UK tour, writes James Watkins. The band will play G Live in Guildford on March 15 as part of a series of shows in smaller than usual venues with an intent on staying clear from stadia and arenas that can alienate the audience. “I’m really looking forward to it. This tour will be a lot of fun,” Jimmy said. “We have some of the most amazing people who have followed us in the years and a huge British fanbase. Jimmy and his brothers have ensured the shows are strategically planned, so that the band will not wear themselves out when travelling and can give their all to the fans. The more relaxed approach to touring will allow them to be more spontaneous during the shows as they will be allowing fans to request their favourite tunes. “We have an acoustic set and people can yell out songs that they want us to do,” he said. Jimmy who starred in the musical Chicago in Guildford, is looking forward to returning to the town and Surrey’s countryside. “I fell in love with this country,” he said. “One of the reasons we are doing the tour is to get to see more of the country than we ever have before. “For so many years on tour we have just gone from hotel to hotel, only seeing the view from the window,” he added. 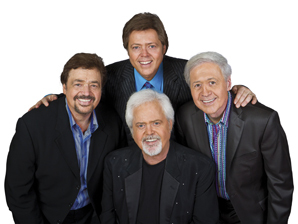 The tour is something of a landmark as it is the last to feature Merrill Osmond, who is moving off in another career direction. The milestone has given Jimmy a time to reflect on the band’s history. “It’s going to be bitter-sweet. It has really been an amazing ride, we don’t deserve it. The Osmond fan base, which Jimmy fondly described as a ‘friend base’, will be treated to all of the hits as well as the band showcasing new material. Jimmy has no definitive plans after the tour, but he hopes to continue working in England and pursue his love of musical theatre.